If you’re happy and you know it… – Do My Eyes Look Scary? The Chicago Tribune posted an article on their website about the ’10 happiest states’ based on a Gallup poll. After reading the original Gallup article I noticed one glaring problem with this whole idea. 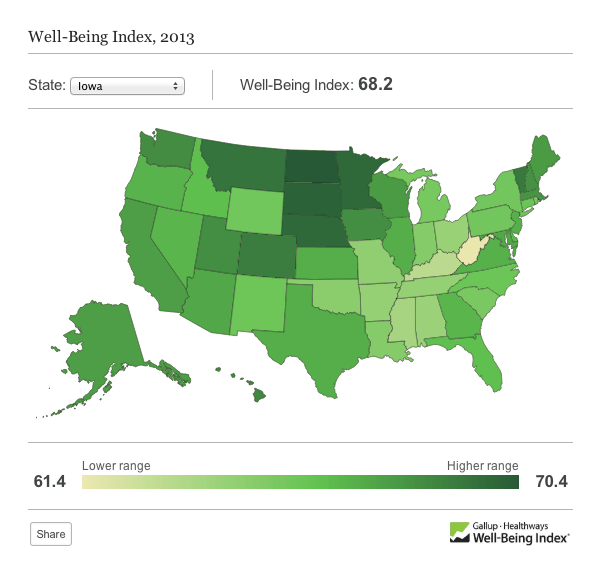 The ‘Gallup-Healthways Well-Being Index’ — note that it’s ‘Well-Being’ not happiness — is a zero to 100 score. Zero isn’t actually defined, though presumably it means “everyone is dead or dying in a blasted, toxic landscape” and 100 means “ideal well-being.” The whole-country index is 66.2, and has oscillated around an average of about 66.5 for the past 5 years. The highest-scoring state scored 70.4 and the lowest 61.4, meaning to me that the best and worst are actually very close together. Where ‘close’ means the two numbers are close numerically, in a system where the meaning of distance is entirely undefined. What does this actually mean? You tell me! Would I notice the difference of 2/10th of a something-or-other if I went from Iowa (68.2) to Massachusetts (68.0)? Probably not. North Dakota’s winning score comes substantially from the increase in jobs and wages due to the boom in the petroleum industry. Just the other day I was reading about the problems arising from the influx of out-of-state workers, rising housing costs, increases in pollution that are happening there. So are they really… err… being weller, or are they just momentarily glad more people have jobs, and in a bit they’ll realize their rural paradise is going to be ruined by high-impact resource extraction? Bottom line, the happiest people involved in this whole business are Gallup and Healthways, both of whom have something to sell. And, of course, the Tribune, who suckered people into giving page views to a story with exactly zero relevant information.